Finished wax piece with examples of bronze ingots in the background. Uncoated and coated versions of the base of the bronze, alongside other customers’ pieces. 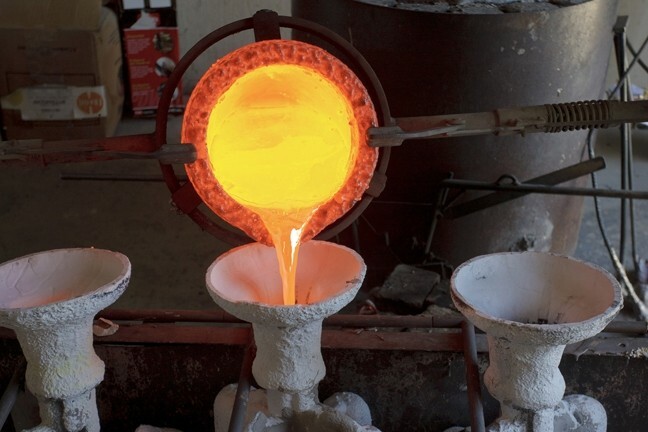 Nine coatings of colloidal silica, refractory stucco flour, and refractory sand are coated onto the wax mold to create an inverse mold to hold the molten bronze. 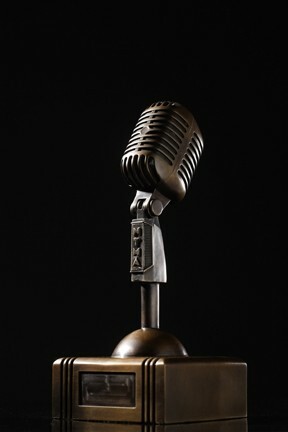 Genesis Bronze of Paso Robles was tasked with creating the bronze beast that is the 2010 New Times Music Awards trophy. 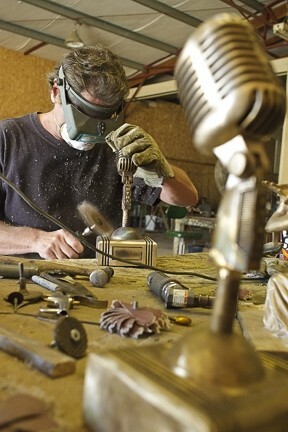 Thanks to efforts of five artisans and a 50-step manufacturing process, the first-place winners of the competition’s various divisions will be awarded a trophy worthy of their artistic talent. 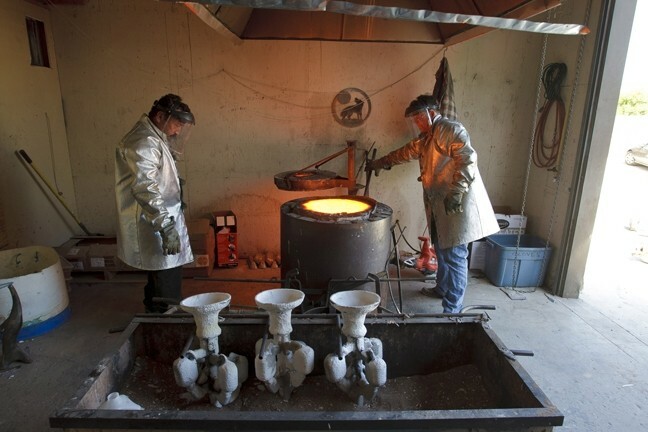 John Kemple, owner of Genesis Bronze, has finished 40,000 castings over 15 years. His talented staff includes wax technicians Lisa Johnson and Dorothy Boyle; Alan Baxter who did the technical sculpting and worked as main metal finisher; and Alphonso Sepeda, the patina expert who also helped Kemple with the casting. 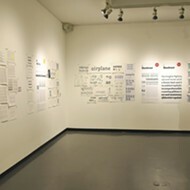 These images capture just a few of the steps that went into the creation of the award. 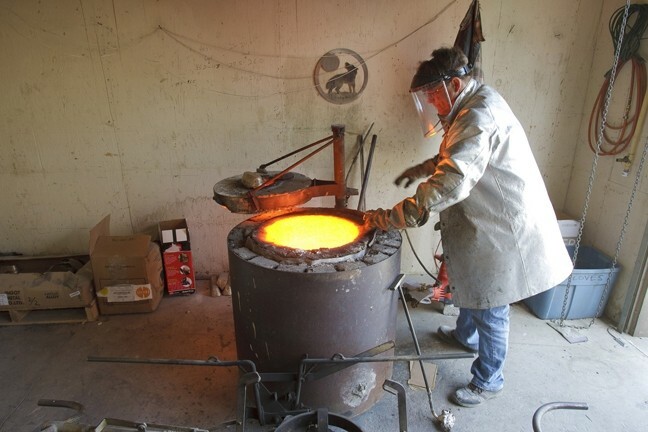 The molds are placed in an oven that melts away the wax and heats it to a temperature appropriate for pouring the molten bronze into. John Kemple prepares the furnace to begin pouring bronze. 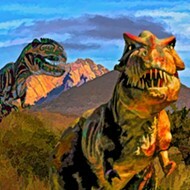 Steve E. Miller is New Times’ Staff Photographer. Send comments to semiller@newtimesslo.com. 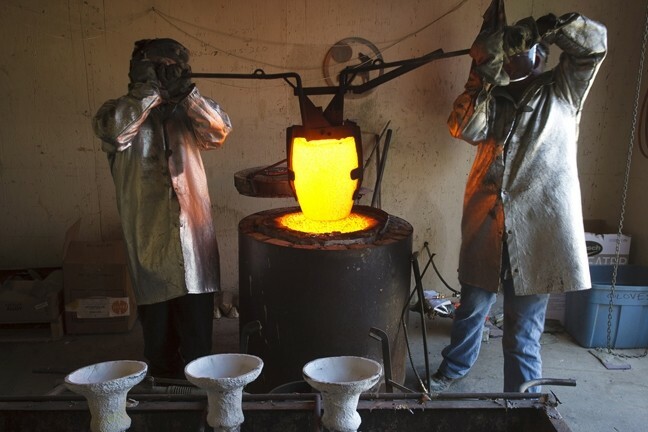 Alphonso Sepeda, left, and John Kemple, right, prepare to pull out the crucible containing the molten bronze. 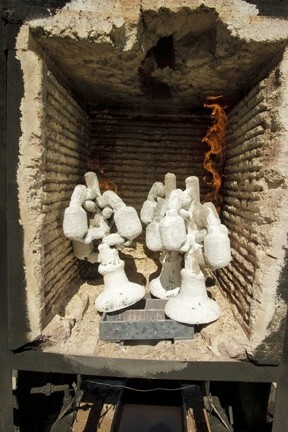 The crucible is removed from the furnace. Liquid bronze fills the mold. 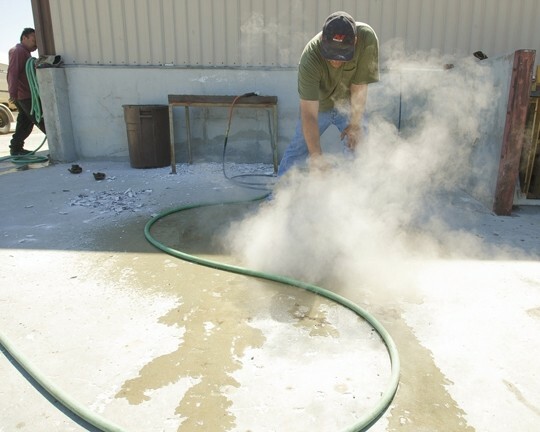 John Kemple sprays the mold with water to break away the plaster mixture from the bronze. 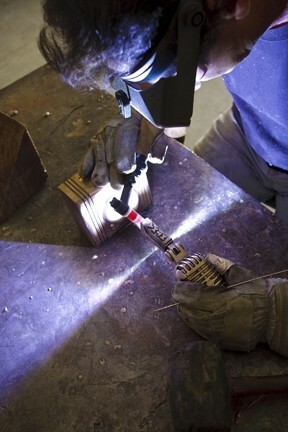 This process can be done within minutes of pouring the molten metal into the mold. 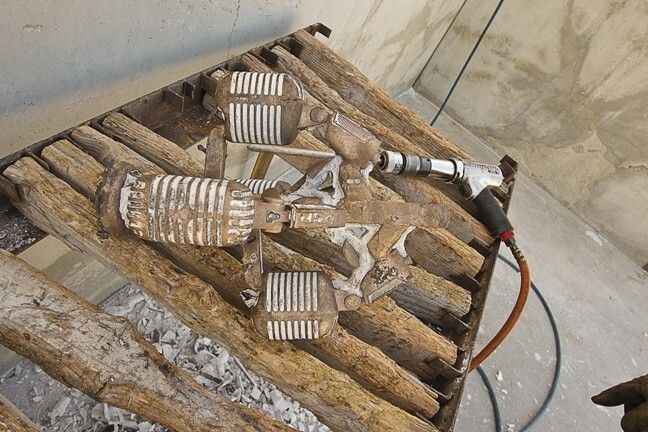 An air hammer is used remove medium and large sized chunks of mold from the bronze. 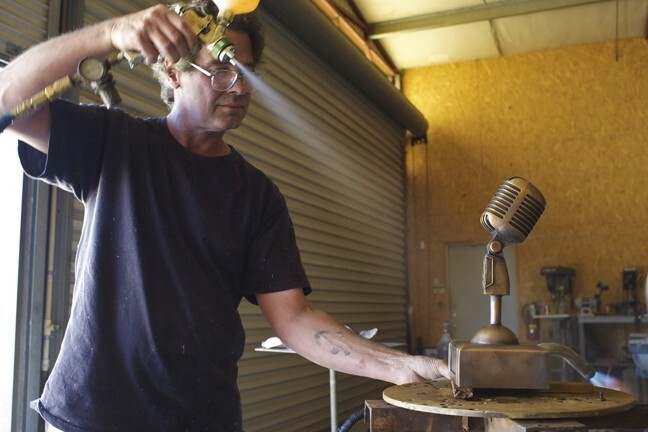 Alan Baxter welds the base of the bronze to the microphone figurine. 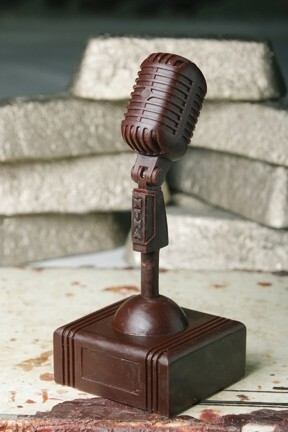 Baxter sands down one of the awards to prepare it for the patina. 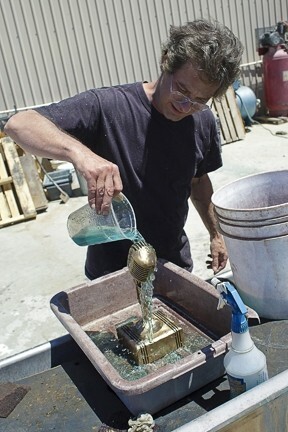 Baxter pours a secret chemical mix over the sculpture to create the patina. The finishing touches to the patina include a chemical spray, heating, and a wax shine. Mo/Tav's Motown Brodown Movember event draws a hairy crowd!